The Firmamentum is a unique measurement and navigation instrument. 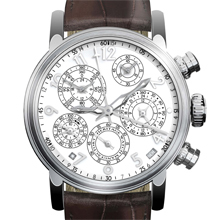 Fully in the tradition of the historic watches used for observation, it not only measures the earth’s rotation, thus giving the classic measurement of time, but with the aid of the hour angle it permits measuring the movement of the sun and planets in our solar system as well as that of the stars. The hour angle based on the sun — the solar hour angle — can be simultaneously read off two displays. 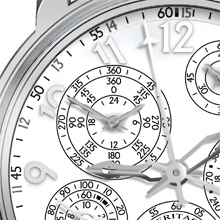 A unique mechanism with a variable-speed of gear train has permitted the second display to be designed such that it can immediately be changed over to display the hour angle based on the stars — the sidereal hour angle — by a pushbutton located at the 2 o’clock position. Firmamentum therefore not only permits the simultaneous observation of two heavenly bodies within our solar system, but also the observation of the sun or a planet in our solar system as well as a star external to it. Both displays have been designed such that they not only show angular degrees directly, but also the solar and sidereal hours and minutes as used by astronomers. At the same time, the hours, minutes and seconds can be read off just as in a normal watch, while in addition the fixed solar time display has been conceived such that it can be used for a second time zone with a 24-hour display accurate to the minute. The various methods of navigation can be directly read off from the dial of the Firmamentum in a truly unique fashion. The Firmamentum also has a second pushbutton integrated at the 4 o’clock position that synchronizes the time in accordance with a time signal. 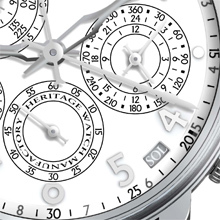 The power reserve indicator brings the underlying data of the watch to the fore. A stop lever halts operation of the watch movement after a running time of 56 hours.